A family on summer vacation gets stuck in the mud on a stormy night. They seek shelter in the home of a nearby toymaker and his wife. They are allowed to stay the night with a few other storm-weary travelers, though it may wind up being their last night alive as the toys in this house may not quite be what they appear to be. Beware kind, old couples who readily let strangers stay in their doll-infested home. Killer doll movies seem to have been all the rage in the late 80's. 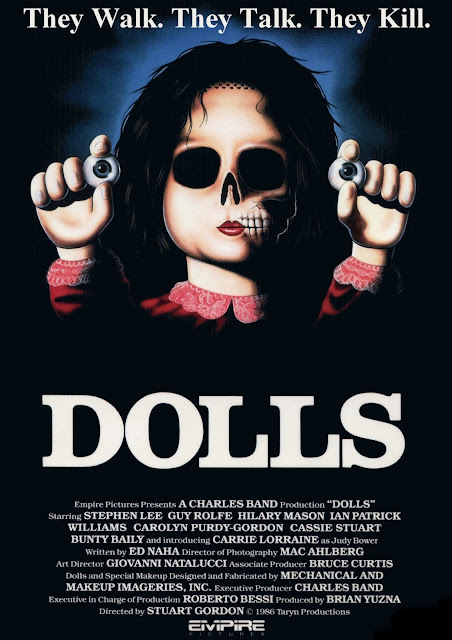 "Child's Play" is obviously the most notable of the genre, but a year prior in 1987 came Stuart Gordon's "Dolls." Gordon is known for directing numerous horror films like "Re-Animator," "From Beyond," and "Dagon." The feature is written by Ed Naha, who worked on movies like "Troll" and "Honey, I Shrunk the Kids." It stars Ian Patrick Williams as David Bower, a very bad father who neglects his daughter and is more interested in his wealthy new wife Rosemary, played by Caroline Purdy-Gordon, who is the definition of a wicked stepmother. Joining them is Carrie Lorraine, who plays David's mistreated daughter Judy, as well as Guy Rolfe and Hilary Mason, who play Gabriel and Hilary Hartwicke, the toy makers who invite the Bower family into their home when they get stranded in a storm. Also in the film Cassie Stuart, Bunty Bailey, and Stephen Lee as the three more weary travelers who get stuck in the torrential downpour and are invited into the Hartwicke home. The Hartwick couple seems too kind to be true, but these stranded travelers could not imagine what tests they would endure in the night to come. Remember that scene in "Toy Story" when all of Spike's toys come to life and attack him? Well, that's basically what happens in "Dolls." This is a fun, creepy story where seemingly innocuous toys and dolls come to life to kill the morally reprehensible. Many horror films offer a moral tale to go along with gore and mayhem, and this one is no different. If you are mean, nasty, cynical, and self-serving, you can be sure these toys will come for you in the night. The magic of bringing these toys to life seems to be achieved through both puppetry and stop-motion animation. The stop-motion aspect gives the film a really cool look. There is a lot of humor in the movie as well. We get a lot of little jokes and darkly humorous situations. Stuart Gordon has a knack for these low budget comedic terror films, and if you have liked any of his other work, you will enjoy this one as well. The acting isn't great and the dialogue is often super cheesy, but it still manages to be a really good time none the less. It is every bit as good as almost any other killer doll movie we have seen.